I was wondering if anyone had a really good and practical way of storing print sheet music. If there is any specific types of folders or cabinets that they use to store their sheet music. I would like to know ways of storing music for later use and storage for frequent use sheet music. I want the system to hold a large amount of sheets. I'm going to focus on storage for the average musician's collection of music, not the music of a collector who keeps valuable manuscripts. When I am storing music, the most important considerations are that 1) I don't damage the music, and 2) that I can find the particular music I need with ease, and 3) That I'm not wasting space. Books of music can often be stored on an everyday bookshelf, if you have tall shelves. I've found most music is just about as deep as my shelves. This is a good cheap option if you are on a budget. Use bookends to keep the music from sagging sideways and bending if the shelf isn't full. File cabinets are better for loose sheet music, but you may need to put the music in the cabinet the long way if it doesn't fit across the cabinet's shorter dimension. Put the music in correctly labeled file folders. If the cabinet isn't very full, the music will tend to bend if the file folders spread out. You can buy blocks to keep the folders from sliding to far: they work a lot like bookends. The problem with bookshelves and file cabinets is that most music doesn't have the name written down the spine - it's too narrow. To fix this, you generally need to make custom labels. File folder labels, or a piece of cardboard about an inch deeper than the music will solve the problem. Stick the cardboard in the shelf between the music at the start of a new composer, and write the composer's name on the end. Then you get music of extra large dimensions, that sticks way past the edge of your bookshelf, or requires such extra long folders that it doesn't fit in the same cabinet at your other music. You can buy dedicated music cabinets that will fit even large music manuscripts, but if money or space is important, it may be easiest to stack this in a box on top of a filing cabinet, or top of a bookshelf, where it won't be easily damaged. If you've got a lot of music, being able to find a particular piece is an important part of storage. For me, I separate music out by instrument, and then arrange it alphabetically, either by composer or title, whichever is more memorable. (Vivaldi's Gloria is under V for Vivaldi, but the pop song Four Leaf Clover is under F for Four. It means that I can find all my music by looking in only two or three possible locations. Not having any organization means searching through a foot high stack of sheet music, or worse if you've got more. If you are worried about making the music last as long as possible (you've got an original, handwritten Mozart composition, for example), you'll want to store it in a dry, climate controlled space, out of direct sunlight or darker, and minimize the contact of your skin with it as much as possible. I use cheap pocket file folders. They are two kinds cardboard pocket files, and there is plastic. They are made to grow with what you put in, it has such bend's it becomes wider. if you put in the conductors score with all the parts it could become quite thick. Then you bend the up and down flap,the side flap and there is strings that hold it closed. Then I put it as a book on a bookshelf. You can use an iPad running an app called “Scanner by Readdle” (about $10) to store an almost unlimited amount of sheet music. Scanner uses the iPad camera to convert your sheet music (or any document) into a PDF. All you have to do is center each page within the iPad window and it does the rest automatically. Much faster and easier to use and better results than a flatbed scanner. Note that it does not just take a photo. It knocks out the paper and stores the lines only so you get small, functional PDF’s. Then you take the paper version of the sheet music and you put it in a box for safekeeping. You won’t need to access it again because you can read it off the iPad, which also has easier page turning than paper and a built-in light. The iPad can also mount onto a music stand so it doesn’t move or fall. Should you lose the iPad, you simply buy a new iPad and your sheet music restores from the iCloud backup. You don’t lose your valuable sheet music. On the other hand, should your boxes of sheet music get damaged in a flood or other accident, you still have them both on your iPad and in the iCloud backup of that iPad. So you are not just storing your sheet music in a tiny iPad that you can easily carry anywhere and easily utilize, you are also protecting your investment in sheet music. I visited this site about 2 months ago, and went online looking for something that would help me (an average musician, not a pro) sort and store lots of loose music pieces, along with a number of books of music. On Amazon I found the IRIS Large Magazine Holder, 8 pack, black, for a very reasonable price (under 10 bucks not counting shipping) so I bought it. The shipping was quick, and to my delight (and somewhat surprise) these were PERFECT! They're sturdy but lightweight, the design is open enough to make thumbing through music easy but designed to be strong, just flexible enough to make them easy to work with, and open at the front to make removing music easier. They're advertised as large magazine holders but I think they're wonderful for storing sheet music upright on a bookcase shelf. Plus the plastic is smooth on the bottom (check when they arrive to be sure, if there's a tiny spot file it off, I didn't find any) so moving it around won't scratch your wooden shelf. I solved my sheet music storage problem literally overnight with these, and with the extra couple of holders I'm using them for magazines I keep. I had a teacher in college who collected most of his music library in a lateral filing cabinet similar to this one, and this seemed to work pretty well. He was able to organize the music and it allowed for the use of bound music and folders for loose-leaf music. My current method involves stacking music flat on lots of wide shelving. Unfortunately, I'm finding that method doesn't scale well. Like any book, sheet music should be stored and filed usually in a cabinet. I would recommend putting all sheet music in an organized fashion vertically unless you are going to use the music. In that case, stack it up on a piano or a table. Be careful when leaving sheet music out on tables. Things get spilled, cats/dogs scratch and sniff, and constantly moving the books could result in them getting ripped or damaged. If you want music to last for a while, do not bend or throw the books. Do not leave music out in the sun or in damp areas. An ideal place for music would be a dark, dry place where no one will be able to access the book unless they really needed it. In my music room... I put a shower curtain in the closet and bought extra shower curtain rings at thrift stores etc. Drilled a hole in clothes pins- ran shower curtain ring through hole and clothes pinned the sheets alphabetically. Storing music flat is the best use of space, in my opinion. I put the music top-in, and I put my various books and loose music in stacks according to categories, such as: classical piano solo, jazz/popular piano music, sacred piano music, various instrumental solos with piano accompaniment, vocal solos with piano accompaniment, chamber music with piano. If I have a piece that is all loose sheets, I will put the sheets in a folder or stuff them into a sheet protector before putting it in the pile. This does not include the hundreds of songs I have collected so far as an accompanist for choral groups. These octavos do not even go on the shelf. I pack them in file boxes and label the boxes "holiday including patriotic" and "non-holiday including sacred." I have some other file boxes with hanging folders which I use for my compositions, one for works in progress, the other for completed works. The books I have which are for study (theory, history, biographies, complete scores of masterworks, etc.) are treated like regular books and stand upright on the shelves. I bought a six drawer dresser to store my sheet music in. Where practical I put a sticker on the front of the piece or book of collections. I have a loose leaf folder which I use as a catalogue. The book titles and its number are listed at the front and then a page for every composer. I list the pieces under each composer and which book to find them in. The music is then just kept in numerical order and I can find any piece easily. Pieces I use regularly I photocopy so that I am not damaging the original. This is for a collection accumulated over 30 years. Jane Scott is a new contributor to this site. Take care in asking for clarification, commenting, and answering. Check out our Code of Conduct. This may not be the solution your are looking for, but if you have loose pages like photocopies or PDF print outs, you can get them spiral bound at a shop like FedEx Office. I even had the glue binding cut off cheap Dover editions and replaced with spiral binding. Pages lay open easily with spiral binding, but it may give you some other storage options instead of using lots of folders and file boxes. 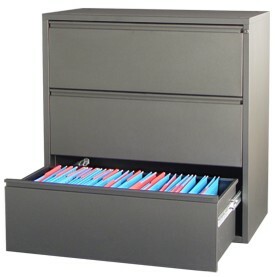 Personally, I use two of these simple file sorters on top of my piano. http://amzn.com/B0033UJ6HW They do a nice job of holding up thin piano albums, because there is only about three inches between dividers, and I can grab things quickly. The down side is obvioiusly it can't store a huge collection and there is no protection for dust, humidity, etc.